Pictured is Lee, a male polar bear at the Denver Zoo. Lee will be arriving at the Columbus Zoo and Aquarium this fall. 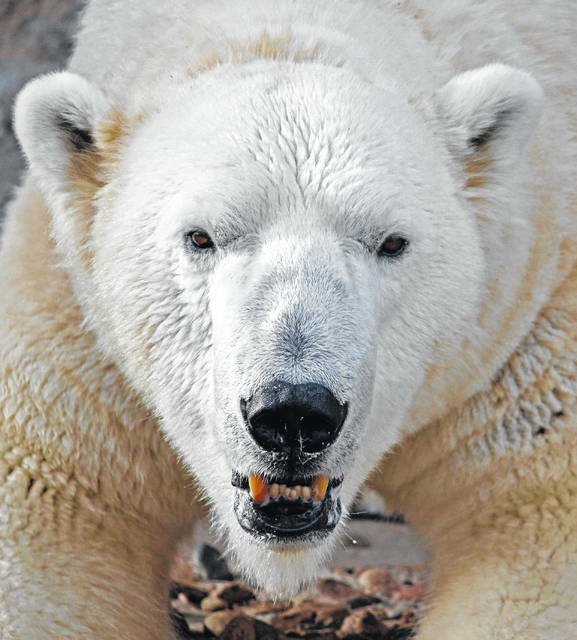 Columbus Zoo and Aquarium team members are looking forward to welcoming Lee, an 18-year-old male polar bear, who will be arriving from the Denver Zoo later this fall. The move was recommended as part of the Association of Zoos and Aquariums’ (AZA) Species Survival Plan® (SSP), a cooperatively managed program designed to maximize the genetic diversity and increase the population sustainability of threatened and endangered species in human care. Currently, there are only 44 polar bears in North American zoos, and the species is facing increasing threats in their native range. After completing a mandatory quarantine period upon his arrival, Lee will be introduced to 11-year-old twin sisters, Aurora and Anana, for potential breeding. The Columbus Zoo has been successful in its polar bear breeding program with four surviving cubs born since the Zoo’s Polar Frontier region opened in 2010: Nora (female, born on Nov. 6, 2015 to mother, Aurora, and father, Nanuq, and now lives at Utah’s Hogle Zoo); Amelia Gray (female, born on Nov. 8, 2016 to mother, Anana, and father, Nanuq); and twins, Neva (female) and Nuniq (male), born on Nov. 14 to Aurora and Nanuq. At over 650 pounds, Nuniq already outweighed his mother and recently moved to the Henry Vilas Zoo in Madison, Wis. Amelia Gray and Neva are set to move to The Maryland Zoo in Baltimore soon. By moving the weaned bears to other AZA-accredited facilities as per SSP recommendations, this allows for the opportunity for Lee to be introduced to Anana and Aurora. Since the passing of the twin sisters’ former mate, Nanuq in 2017, this new breeding recommendation could potentially result in the births of cubs in the future. These births are important to the survival of this species, which in 2008 became the first species to be listed under the Endangered Species Act as threatened primarily due to climate change. “Not only is Lee sure to be beloved within our central Ohio community, but we know and appreciate that he is an important ambassador for polar bears in their native range. We are proud to soon welcome Lee and continue working toward protecting the future of this threatened species,” said Columbus Zoo and Aquarium President and CEO Tom Stalf. Polar bears are native to the circumpolar north, including the United States (Alaska), Canada, Russia, Norway and Denmark (Greenland). They are at the top of the Arctic food chain and primarily eat seals. Polar bear populations are declining due to the disappearance of sea ice, and experts estimate that only 20,000-25,000 polar bears are left in their native range. Some scientists believe if the warming trend continues, two-thirds of the polar bear population could disappear by the year 2050.